Topic – Where do you knit? Topic – One great knitter. Oh boy, this is tough. I admire a lot of knitters for a lot of different reasons. If I only get to choose one person right now I think I will have to pick my maternal grandmother. She is not the grandmother that taught me to knit, but she is an amazing craftswoman. She knits, crochets, sews, quilts, spins, makes natural dye, dyes yarn, weaves baskets, and about 10 more things I can’t name now. My grandma sticks to knitting small projects now, but she used to make sweaters, vests, blankets, mittens, hats, etc. Unfortunately I didn’t always appreciate the hand knit gifts as a child, but at least one of the sweaters that my sister and I wore as children has been passed down and worn by my niece. When my uncle and cousin had sheep, my grandma would take the shearing and wash, card, dye (her own homemade dye), spin and then knit the wool into something useful. AMAZING! I admire her for learning to spin in her 50s/60s when she retired. I made a special point of asking her to teach me to spin. I am no good and don’t practice, but when I retire I plan on taking up spinning and I can always say my grandma showed me how. When we were kids a trip to grandma’s house meant doing at least one craft. We would help her tie a quilt, make wreaths, or weave baskets. I remember all of the fun we had and realize now how special it was to do those things together. Basically, I think my grandma is one of the best ever. Today’s Topic – What pattern or project you aspire to. 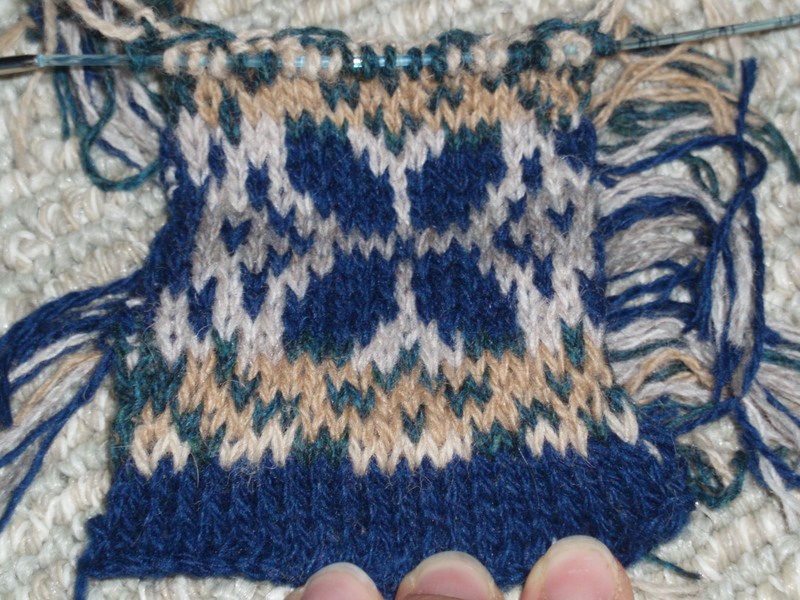 I am half way through the planning of the project I aspire to, my fair isle inspired sweater pattern. I have the yarn, the chart done, I did my two color practice project, one swatch done and one more swatch with steeks to go, and then it will be some math and onto the knitting. It is quite the undertaking but I am more excited than intimidated. I tend to jump right into the deep end head first when it comes to new knitting techniques. What is the worst that can happen? I get to frog it and reuse the yarn for something else. This project has required a ton more planning than I am used to for knitting, but in the end I think it will be worth it. I have a vision in my head of what I want my sweaters to look like and so far everything is right on track for this sweater. I am sure I just jinxed myself by saying that. Oh well, here is my first swatch, again. I just found out about the Knitting and Crochet Blog Week from a friend and thought I would try to participate. Info about the week can be found here. Basically, we bloggers are going to post about common crafty type themes every day for a week. I am not sure how well I will do but it can’t hurt to try. Today’s topic is all about how you started out. I have posted about this before here. Ok, done with day one, right? I know that seems super lazy, so I will summarize the previous post. I know this has been eagerly anticipated, but the winner of last week’s contest is…………….Jeana! The yarn will be heading your way shortly. I miss WI some days more than others, but today on NPR I heard something that made me nostalgic for home. When I was in school we memorized the state animal (badger) state flower (wood violet) state rock (granite, I think) state dance (polka, Ump Pa Pa) and so on. Now we have a state microbe! Lactococcus lactis is, of course, the starter for cheese. You can listen to the story on NPR or I found the microbe’s page at UW-Madison here. I found a link to WI state everything too. That is all, we’ll be back to your irregularly scheduled knitting blog soon. Oh, and enter my contest!